I knew that a woman named “Mrs. Rose” lived in my house in the middle of the nineteenth century, but nothing more about her: when I saw the name on the 1851 map that I featured on my last post my curiosity was piqued. So I took advantage of a free snow day yesterday and searched for some biographical details, which were not too difficult to find. I have a general disdain for genealogical work, but Mrs. Rose was so well-connected that at least an outline of her life came together pretty easily. 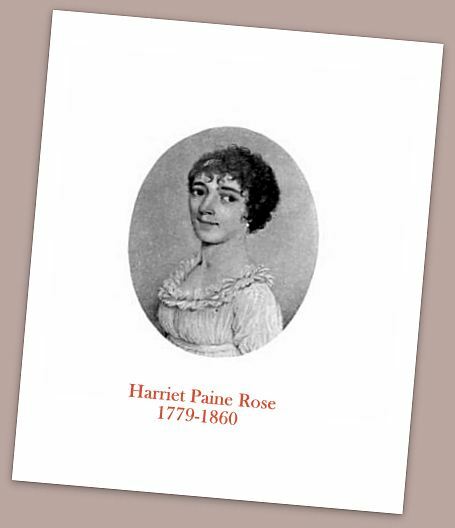 She was Harriet Paine Rose, born in 1779 to parents from two prominent Massachusetts families: the Paines of Worcester and the Ornes of Salem. Imagine being of her generation: she was born in the midst of the Revolutionary War and died on the eve of the Civil War, in 1860, right here in Salem (though not right here in my house, but that of her daughter’s, down Chestnut Street at #14). Her father, William Paine, had come to Salem from Worcester to study medicine with the renown physician Dr. Edward Holyoke and presumably met Lois Orne, the youngest daughter of wealthy Salem merchant Timothy Orne, at some social occasion. There are two charming portraits of Harriet’s mother and aunt by Joseph Badger in the Worcester Museum of Art, and I can’t resist showing them here. 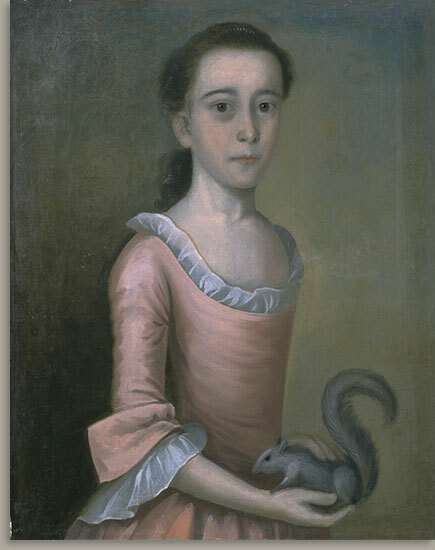 Lois Orne (Harriet’s mother), at 21 months and Rebecca Orne (Harriet’s aunt) at age nine by Joseph Badger, 1757, Collection of the Worcester Museum of Art. 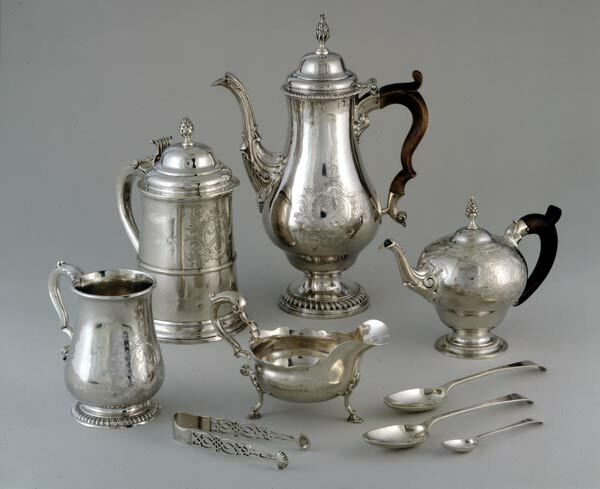 Lois and William were married in Salem in 1773, with Miss Orne’s dowry receiving considerable attention: an extravagant silver tea service made by Paul Revere, his largest private commission. This was a service that “attested alike to the solidarity of her fortune and lustre of her descent”. Quite ironic, as a year after their wedding the Paines decamped to Britain, as William was a Loyalist! There he completed his medical education and was successively appointed an apothecary and surgeon to the British army. 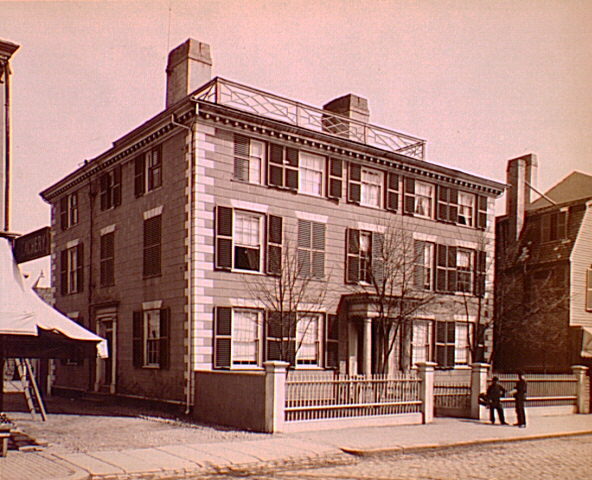 The family was stationed first at Newport, Rhode Island (where Harriet was born in 1779) and later at Halifax, Nova Scotia, where they remained, as exiles, after the Revolutionary War. Paul Revere’s “Paine Service”, Collection of the Worcester Museum of Art. Family drew them back, apparently, first to Salem in 1787 and then to Worcester, where they took up residence at “The Oaks”, the Paine family estate, now (again, rather ironically) owned by the Daughters of the American Revolution. I don’t know how the Paines were received at that time, but Dr. Paine eventually became a naturalized citizen in 1812. So Harriet spent her adolescence and teenage years in Worcester, but that’s about all I know: I’m not sure if or where she went to school, or when or how she met her eventual husband, Joseph Warner Rose, whom she married in 1802. The Ancestral Homes of Harriet’s Grandparents: The Timothy Orne House in Salem, Frank Cousins photograph, c. 1890 (the house is still standing on Essex Street, though much changed), and the Timothy Paine House in Worcester (“The Oaks”). I really do wonder how Harriet met her husband because he was quite exotic: Joseph Warner Rose was an Englishman who, at that point, had never been to England: he was the son and heir of the owner of a large sugar plantation owner in Antigua, where he had been born. The Rose plantation, called “The Valley”, was located six miles outside of St. Johns, in an area which is still called “The Roses Estates”. By 1803 the newlyweds were on the island, and Harriet was in an altogether different world than her native New England: a world of sun and heat and bright colors and slavery. I have no idea how she felt about this; I don’t think I could find out, unless there is some diary somewhere. What I do know about her life on Antigua over the next 15 years or so is revealed by parish records of births and deaths: Harriet bore nine children, seven of which died in infancy. Perhaps because of these successive tragedies and their impact on his wife, Mr. Rose brought Harriet back to Massachusetts with their two surviving daughters and remained there himself for a while. There are references to health problems (blindness?) on his part, which drove him to London for treatment, and then back to the island, to settle his affairs. While there, he died unexpectedly, and Harriet was left a widow in her early forties. She never returned to Antigua, and I have no idea what happened to the Rose Plantation or its inhabitants other than the fact that slavery was abolished throughout the British Caribbean in 1834. 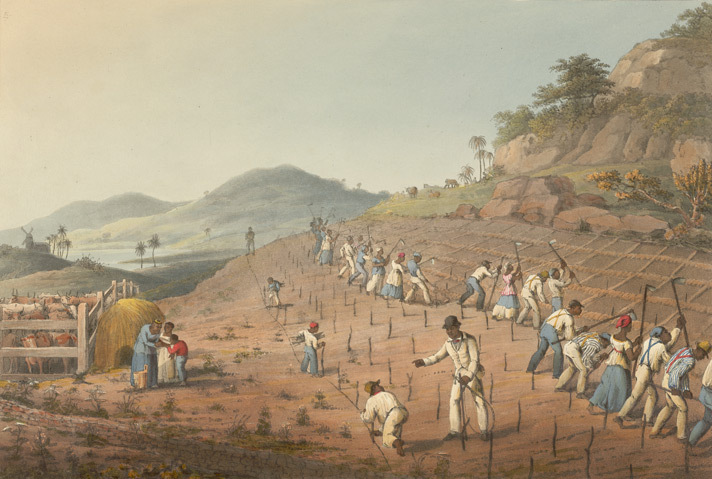 William Clark, “Digging or Rather Hoeing the Cane Holes in Antigua”, from Ten Views in the Island of Antigua, aquatint (London, 1823). The very same year that her husband died, Harriet’s eldest daughter, also named Harriet, married John Clarke Lee of Salem, an aspiring businessman from the same interconnected social circle in which all of her cousins seemed to dwell. 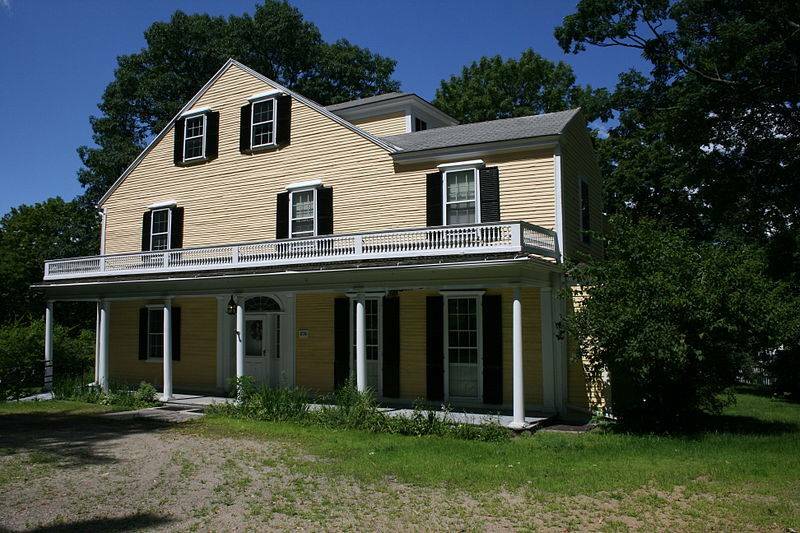 This union would produce ten surviving children and the Lees would build the grand Greek Revival at 14 Chestnut Street which would later become the home of the renown Salem artist Frank Benson. The senior Harriet, my Mrs. Rose, remained in Worcester until the death of her father in the 1830s (Lois had died a decade before) and then moved to the city of her maternal ancestors, and my house. The 1850 census lists her in residence, aged 70, with one Jane McCracken, 29, from Ireland, whom I assume was a servant: 10 years later she died at the Lee house just down the street. In the last few years of the nineteenth century, several of Harriet’s direct and more distant descendants wrote genealogical histories which reference her, and even attempt brief characterizations. Her niece’s account, A Sketch of the Children of Dr. William Paine, 1774-1869, emphasizes her virtue (in her pew at St. Peter’s she prayed every Sunday for the President and all others in authority) as well as her great beauty, an attribute that is also noted in the slightly-more detached Pickering Genealogy by Harrison Ellery. Ellery also notes that Mrs. Rose was “the last person in Salem to wear a turban” and includes a heliotype image of a portrait miniature (below) in the possession of her grandson which is, he assures us, a very unsatisfactory likeness, and is said to give one no idea of her beauty. This entry was posted on Thursday, February 6th, 2014 at 7:33 am	and tagged with Art, Chestnut Street, great houses, Home, Photography, silver and posted in History, Home, Salem. You can follow any responses to this entry through the RSS 2.0 feed. I really enjoyed reading this, it grabbed my attention quite strongly. One thing though, the girl in the top picture is supposed to be one year old? I don’t think so. Thanks Mark–that’s what the date says, but I’ll check again; I agree. You’re right—around 21 months–that seems more likely. Great post! Keep an eye on PEM at the end of the year – I’ve been working with a team on something that has brought Lois and Rebecca Orne into view. We’re preparing a small show about a Salem cabinetmaker, Nathaniel Gould, and he supplied the large wedding order of full-house furniture suites for the Orne sisters when they were married. Rebecca Orne’s set a new social standard for the expense and quality of a wedding furniture order. 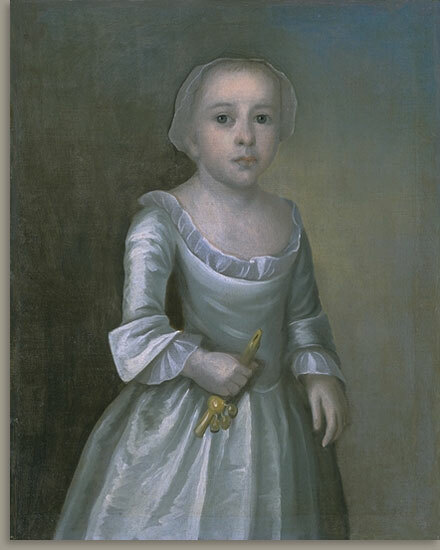 As far as the portrait – it’s worth checking the dates, but it’s also true that something colonial-era portrait painters did was to paint the face of a child subject but modify the body to look older.I can imagine the face belonging to a 1-year-old, but not the standing, lean body! Especially if the paintings were created at one time, with the older child’s need for a portrait driving the engagement of a painter, the commissioners might have wanted a portrait that could represent both in their “child” years, not depicting a baby literally. It’s not an uncommon approach. At the same time, it could be just a mistaken date – some looking into that might yield more information. Thanks Michelle–looking forward to the Gould show! Lois was born in 1756 and the painting supposedly dates from 1757, so she could be just under two years old. Was a wonderful time we live in to be able to find out so much about the people who resided in our homes before us! I feel so inspired to learn about the people who came before me – although a rather shorter list! It’s true, Carol. I especially enjoy all the census data online. Thanks for the interesting story. Great history writing. Phenomenal the role ‘sugar’ has played in social history. The paintings are beautiful. Lots of pewter or Paul Revere’s silver in those portraits. Maybe signifying something spiritual or religious at the time? Interesting question, Steven. I always think it’s just a flagrant display of wealth, but maybe it does mean something more. What an interesting post. When I think of 19th century women and turbans I’m always reminded of James Monroe’s wife. She seems to be the last woman I can recall seeing an image of wearing one. Of course, your Mrs. Rose and Elizabeth Monroe would have been around the same age, or within a decade or so, I believe. I think of Dolly Madison, who would have been slightly older I believe–but I think it is an interesting comment–last person, rather than last woman, too. I loved the idea of the grandson defending his grandmothers erstwhile beauty! REally interesting post. Off to Winterthur tomorrow for the first time! All tips and suggestions welcome! We will have two full days.